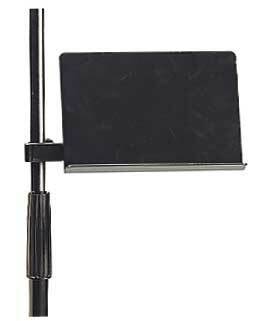 Order your Raxxess Attachable Music Stand from AMS and enjoy Fast & Free Shipping. Get the Best Deal with our Lowest Price Guarantee & Great Customer Service! A handy little device that is perfect for holding song lists, charts, notes, etc. Mounts easily to any microphone stand. Steel and aluminum construction; black baked enamel finish. nice to have this music stand. I use it for everything, Personal Mixer, My tablet and video\sound recording devices. I thought it would be bigger. It works for my phone though, so I guess that's alright. I use this on stage for my words to have as a crutch in case I forget (I sing a lot of songs ) the words . It is real discrete, turn in a little angle and glance over when you need to and the audience really can’t see it and tell you are looking at it . I would be lost without it. Can’t afford a Telepropter , this is small and works great!! smaller than I realized but, great for holding notes, mobile phone, etc. Does not obstruct views for pictures of the happy couple or your close up. Too small to be of use. Great useful and easy to use item for performing musicians. Product is ok. Bolts and securing attachments always a problem. The price is average for the quality. Only one I could find the size! I have two. This one seems a bit better then the first. Both work well. I use it on mic stand to hold Kindle.